City life can be hard, but life in the Egyptian capital Cairo would even challenge a superhero, according to two of the city's residents. 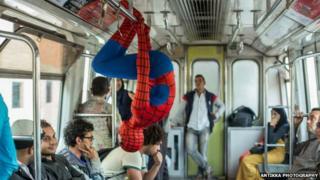 Photos of a man in a Spider-Man costume carrying out everyday tasks around the city have now gone viral, Ahram Online reports. They show the comic book character running to catch a bus, negotiating Cairo's crowded streets, and even being mock-mugged. The aim of the stunt was to highlight how difficult life can be in the city, according to photographer Hossam Atef, who runs Antikka Photography. "All Egyptians are superheroes for enduring these difficulties every day," Mr Atef tells the website. Spider-Man "was exhausted" by his time in capital, according to chef Atef Saad, who donned the stretchy suit. In 2013, Cairo was ranked 122 out of 140 cities globally in a liveability study by the Economist Intelligence Unit. The photo shoot itself proved difficult, as the men were stopped several times by the police demanding to see identity documents. But most people were happy to see Spider-Man wandering the streets in his trademark red and blue suit, the men say. "Children were totally convinced that this was Spider-Man... but older men thought he was one of President Sisi's men who will bring justice to Egypt, and they kept telling him: God bless you," Mr Atef tells the Al-Watan website. "Young people like us, on the other hand, wanted to take selfies with him."